A spectacular show of flowers all summer long. The eyes have it. 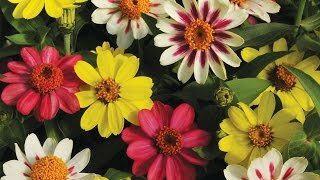 These joyously showy flowers, in bicolor pink with yellow eyes, massed in a sunny border, put on a spectacular show all summer long. The billowy 3 to 4' tall plants produce an abundant flourish of frilled, full to semidouble 4" flowers. The butterflies love them and so will you. Cosmos, Double Take is rated 3.0 out of 5 by 3. Rated 3 out of 5 by Stargazer9498 from Half &Half Half the seeds planted were the double take & the other half were just plain cosmos. A little upset but, that is what you get with hybrid I guess. All in all, they were VERY beautiful! Aphids loved them so beware if you cut and bring in your home! Rated 5 out of 5 by 95127 from Double Take 'Double Take' is what you will say when you see this spectacular Cosmos in bloom. Our Master Gardeners have been growing this variety for 2 years for our annual Spring Garden Market - our major fund raiser. This variety of cosmos starts blooming early on plants up to 5' tall. Covered with double magenta paint-brush stroke petals they are spectacular in garden beds as well as a vase. We cut these flowers well into October.